Ed Brill - IBM and SAP announce "Atlantic"
IBM and SAP announce "Atlantic"
The announcement I've been waiting months to talk about!!!!!! 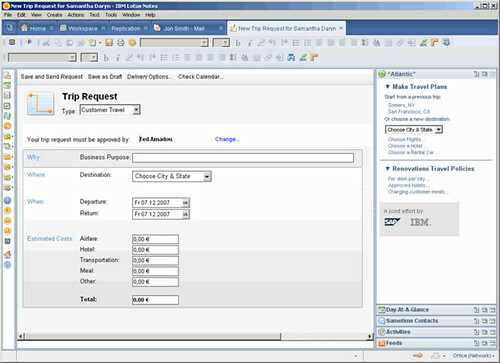 Currently planned for inclusion in the first release of project "Atlantic" is support for SAP workflows, reporting and analytics, and the use of roles from within the Lotus Notes client. 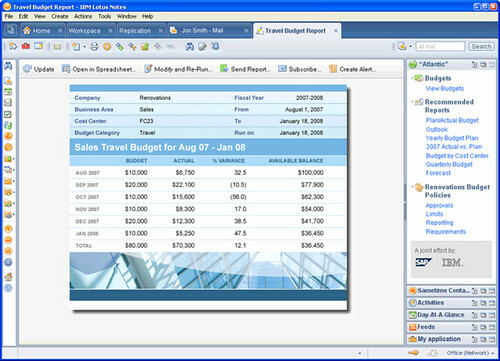 In addition, tools are planned to be included to provide the ability to extend and adapt these roles and capabilities, as well as leverage additional collaborative and offline capabilities inherent in Lotus Notes and Domino products. The initial release is planned to ship in the fourth quarter of 2008 and will be sold by both companies. "SAP and IBM Lotus are strategic partners to The Coca-Cola Company," said Jean Michel-Ares, CIO, Coca-Cola Company. "Our IT goal is to help our people to be more responsive, productive and effective, and SAP and IBM Lotus have helped us get closer to that goal. The partnership between IBM Lotus, SAP and The Coca-Cola Company promises to deliver additional value to our associates and improve the tools they use every day." One of the coolest things about "Atlantic" is that it is customizable. Prior efforts in this space, from us or others, have been relatively static in terms of capabilities. In the meetings leading up to this announcement, I heard over and over how critical it is to have this modification capability. "Atlantic" will ship in Q4 2008, and pricing and packaging are to be announced.